The following is part of a presentation given by PMRA to the recent Team Noel Park Community Open Day. Despite its name, Hornsey Park has no park so, since 2010 PMRA has been both creating and maintaining a number of areas of Community Garden for everyone to enjoy. The ‘everyone’ is significant, given the number of people who live here or visit Wood Green each day for work, to shop or for leisure. The garden not only enhances the area and brings a much needed public garden in which to rest, the visible participation of the community in its upkeep is a beacon of ‘community’ and appreciated by many who know little of the area. 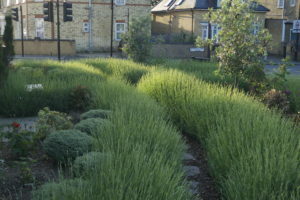 Our greatest endeavour has been the Lavender Garden, created in 2010 on neglected ground at the junction of Hornsey Park Road and Clarendon Road. From the youngest to the oldest, the most recently arrived to our oldest residents, the casual visitor to someone looking to rest or a place that is always open, the gardens lifts hearts and exists only through kind deeds. The plants for the Lavender Garden were chosen to evoke more Mediterranean climes, with lavender, olive, fig and cypress, reflecting the makeup of our community over the past 60 years as well as the sunny and dry character of the site. Many of the plants have been given by neighbours. Care was taken to choose the words for the plaque: it is a message to all who find it that the space, and the nature that has found a home in it is a symbol of our ‘better nature’, bringing us together at any moment and in every season. Hornsey Park Community Gardens, N8 – after the Lavender Garden, what next? Changing the way we see the spaces around us, how we use them and giving them value. Along the way we are helping to build a healthier, happier and safer community. 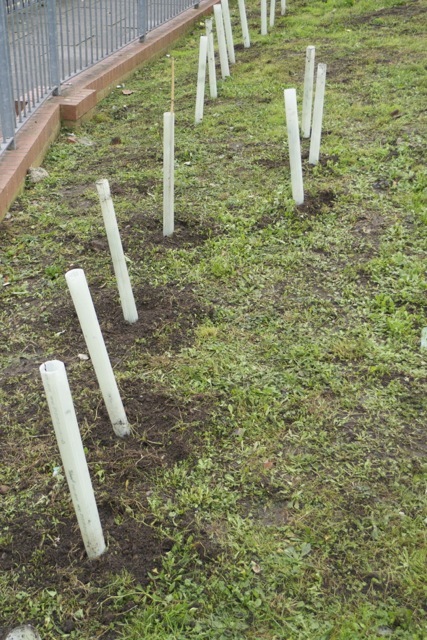 Hornsey Park Community Gardens, N8 – what are we doing? 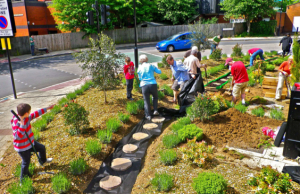 We meet on the 1st Saturday of the month with the long term aim of turning every available, precious corner of public space into a part of the ‘community garden’, each a few steps from the other. We are frequently given unwanted plants, grow our own, find homes for the self-sown, use woodchip from local tree management and compost from the community ‘giveaway’, and don’t use pesticides. The project is led by PMRA, the residents association for Hornsey Park. The task has been one of joining up every part of our community - residents, businesses, The Mall, Heartlands High School, Sky City, the council and wider community groups. We ensure everything we do is sustainable within the resources we have. We do not start with a blank canvass: all of our areas of garden have a problem which the community has sought to solve by gardening together. We need to change how the community sees the space and the way we all use it. Together, we can change places for the better when we put our minds to it and build a stronger community along the way. We work with local businesses and schools, as well as the council. Money is rarely the problem. After a successful campaign and dialogue with National Grid and their developer, St. William, the open space and lime trees, a feature at the centre of the area since Hornsey Park was built over 130 years ago ( and our own Village Green) is to be saved and made into a Pocket Park. 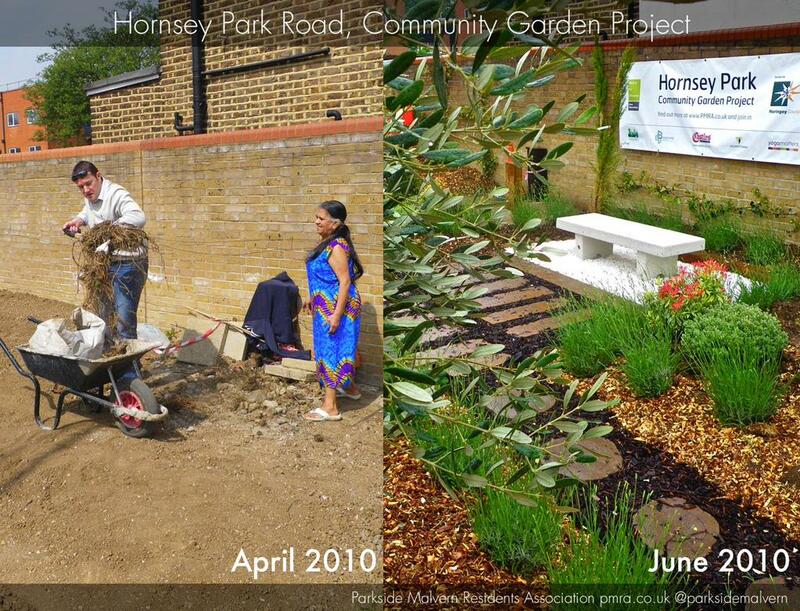 Hornsey Park Community Gardens, N8 – we don’t always succeed but we learn by experience and have achieved a great deal. Two bids to the GLA for funding and one to the Mayor for a Pocket Park have been rejected. Our plans for street planting on Hornsey Park Road have twice been rejected, despite requiring little if any council funding. We failed to progress our plans for a green wall funded by TfL when the council failed to submit an application on our behalf. 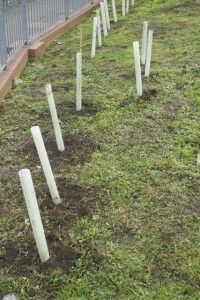 The saplings around the Turnpike Lane junction and Denmark Road, and the hedgerow next to Hornsey park Surgery were cut down by council contractors. Despite great effort, we have failed to engage with either of the main two housing associations. The planters and bench at the end of Martins Walk suffered vandalism and theft, street drinkers and litter: we are trying to manage the problems it brings rather than take away the bench.